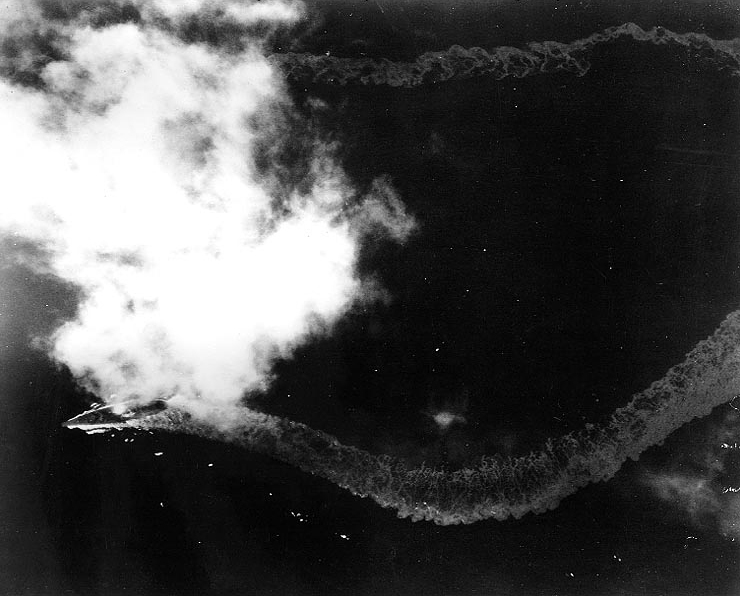 Battleship Yamato makes evasive maneuvers during operation "Ten-Go"
Yamato makes evasive maneuvers during operation "Ten-Go", attempting to avoid further hits by attack from U.S. carrier planes, 7 April 1945. A fire burns amidships from a previous attacks, but Yamato steams on at 15-20 knots, not listing at this point. Photographed by a plane from USS Yorktown (CV-10). Source: U.S. Naval History and Heritage Command Photograph (# NH 62581), courtesy of the collection of Fleet Admiral Chester W. Nimitz, USN. If you have spotted any errors on this page (Battleship Yamato makes evasive maneuvers during operation "Ten-Go") or have anything to contribute please post it on the battleship forum.